Magazine (bulletin) for beer collectors. Russian with English summary, since 1999, 2 times per year, DIN A5, 80 pages. 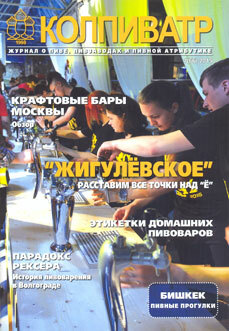 Maintenance: CCBA news, announcements, collector's calendar, breweries, beer events and breweries tours reports, history of brewing in ex-USSR states. Free subscription for CCBA members. For non members subscription please contact etiketki@mail.ru or vladshamov@yahoo.com.